Dialog Axiata PLC operates Sri Lanka’s largest and fastest growing mobile telecommunications network. It is one of Sri Lanka’s largest listed companies by market capitalisation, and largest Foreign Direct Investor with investments totalling USD2.3 billion. Sri Lanka is currently developing its digital economy strategy. This initiative will enable Sri Lanka to identify appropriate opportunities, key enablers, and initiate flagship programmes that will promote Sri Lanka’s Digital Economy strategy. The digital economy strategy will align with the economic development thrust sectors of agriculture, tourism and manufacturing. 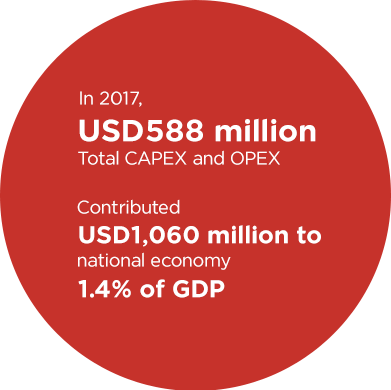 It is estimated that the digital economy for Sri Lanka could contribute 1%-3% to the nation’s GDP by 2019.